In the last post I talked about Scavenges, semi-spaces, new and old spaces, new space to old space promotion, garbage collection algorithms and tracing garbage collection events. In this installment I will discuss the “Mark-Sweep, Mark-Compact” garbage collector. Mark-Sweep and Mark-Compact operate in two phases. Marking (marking all the live objects) and Sweeping, Compacting (getting rid of dead objects and reducing fragmentation if needed). Commonly referred to as mark-and-sweep collector. Marking involves locating and processing all the live objects. An object is considered live if it is being referenced by some chain of pointers to a root object or another live object. Putting it another way, an object is live if and only if, it can be reached by following a chain of references from a set of known roots(e.g. global variables for instance). Essentially, the marking process involves scanning, locating(discovering) and then processing(marking) the live objects. The garbage collector considers all the unmarked (unprocessed) objects as disposable or dead. Marking is done using tri color abstraction, where white, grey and black represent the marking states. In reality they are bits in a marking bitmap. 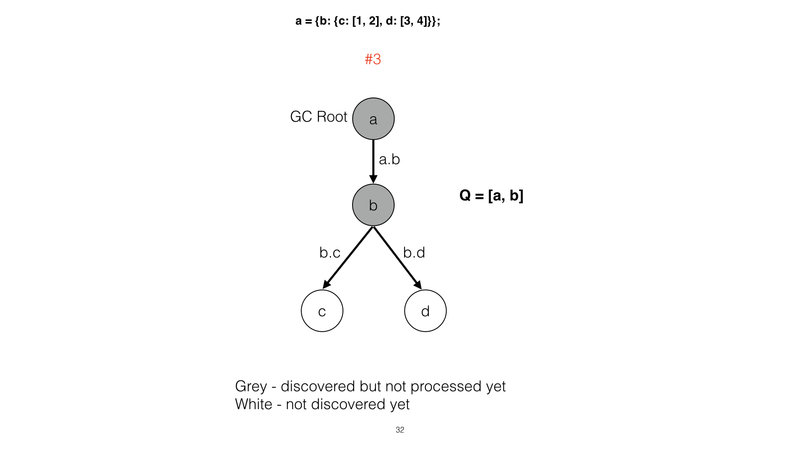 In this, white objects have not been located(or discovered) by the marker, while grey objects have been discovered but not much is known about its neighbors and finally black objects have been fully processed and are considered live. To assist in this effort a marker queue is used which tracks the marking progress. #1. The initial object graph. All objects are white as they have yet to be scanned. The marker queue is empty – Q = [ ]. #2. The scan starts with the root which is the variable “a”. It is marked grey and pushed to the queue. The grey indicates that “a” has been discovered(or visited, located) but has still to be fully processed. In other words its neighbors(children) if any have yet to be discovered. We now have Q = [a]. #3. Continuing with the depth search(following edge a.b) object “b” is discovered, marked grey and pushed on to the marker queue. #4. The depth search continues and object “c” is discovered(edge b.c). It too is marked grey and pushed to the queue – Q = [a, b, c]. At this point the search stops as there is nothing beyond “c”(c is a leaf). #5. As the search cannot continue object “c” is popped from the queue and marked black as it now has been fully processed. In other words it has been visited and it has no neighbors. At this point Q = [a, b]. #6. Now that object “c” has been processed, the search continues by backtracking to the parent object “b”. Continuing it identifies(discovered) object “d” a child of “b”. Object “d” is now marked grey and pushed to the queue. We now have Q = [a, b, d]. #7. As the search cannot continue, object “d” is popped from the queue and marked black as it now has been fully processed. In other words it has been visited and it has no neighbors or children. At this point Q = [a, b]. #9. The search continues by backtracking to object “a”. As all its children(neighbors) have been processed it is considered fully processed and so it is popped and marked black. We now have q = . The queue is empty as all objects have been processed. In this case all objects are live and no garbage collection will take place. As “d” is detached from the tree it is never visited or processed. Object “d”, remains white after the marking process is complete and will be garbage collected. Once marking is complete V8 triggers a sweep event when it believes memory will be required. The sweeper follows a simple process, it destroys all the unmarked (white) objects and optionally compacts the fragmented live objects. Note that the old space could be very large in size. The default is in excess of 1 GB. It would take the collector a long time(in hundreds of milliseconds) to mark a large number of live objects. This would have an impact on performance as, this is, like I have mentioned before, stop the world gc. To avoid this, an “incremental marker” is used. In this, the live objects are marked in small increments or steps, making sure that no step takes more than 5ms giving as much time as possible to allow the application program to run and be performant. Using the same premise as marking, it would take a sweeper a long time to sweep large swaths of memory. For this, lazy sweeping is used, where only the “just” needed amount of sweeping is done based on how much memory that needs to be freed for the current requests. Rest of the sweeping is kept for a later time. Now that the theory is out of the way and that you have understood how marking and sweeping take place let’s trace through the logs of two contrived examples. To quickly illustrate the point we will be running both programs in limited memory space by limiting the new space to 1MB and old space to 20 MB. 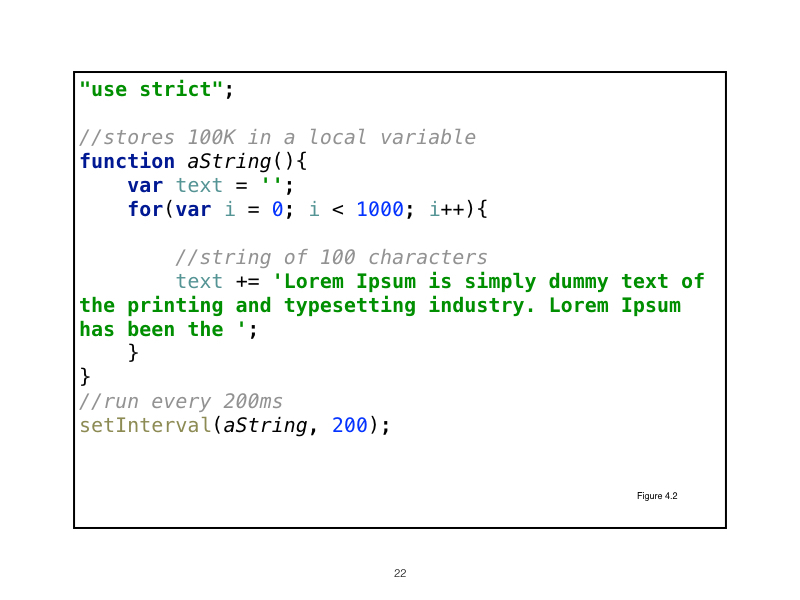 In the first example the program with every iteration, pushes a string of 1,000,000 characters into the array a.b.c. No memory is being freed. As the maximum old space is limited to a little more than 20MB, the application will eventually run out of memory. max_semi_space_size – The size of the new space. This is set at 1MB. Remember there are two semi spaces in the new space. [35841:0x103000000] 72 ms: Scavenge 2.1 (6.0) -> 2.1 (7.0) MB, 0.8 / 0.0 ms [allocation failure]. [35841:0x103000000] 73 ms: Scavenge 2.1 (7.0) -> 2.1 (8.0) MB, 0.7 / 0.0 ms [allocation failure]. incoming data and no data is being deleted. In a time span of about 7 seconds the size of the objects grows from 4.0MB to 8.9MB. [35841:0x103000000] 640 ms: Scavenge 4.0 (11.0) -> 3.7 (11.0) MB, 0.9 / 0.0 ms [allocation failure]. [35841:0x103000000] 643 ms: Scavenge 4.0 (11.0) -> 3.9 (12.0) MB, 1.6 / 0.0 ms [allocation failure]. [35841:0x103000000] 1666 ms: Scavenge 4.7 (12.0) -> 4.6 (12.0) MB, 1.7 / 0.0 ms [allocation failure]. [35841:0x103000000] 2173 ms: Scavenge 4.9 (12.0) -> 4.9 (12.0) MB, 2.4 / 0.0 ms [allocation failure]. [35841:0x103000000] 3181 ms: Scavenge 5.6 (12.0) -> 5.6 (13.0) MB, 2.2 / 0.0 ms [allocation failure]. [35841:0x103000000] 3183 ms: Scavenge 5.9 (13.0) -> 5.9 (13.0) MB, 2.0 / 0.0 ms [allocation failure]. [35841:0x103000000] 4191 ms: Scavenge 6.5 (13.0) -> 6.5 (14.0) MB, 2.0 / 0.0 ms [allocation failure]. [35841:0x103000000] 4698 ms: Scavenge 6.9 (14.0) -> 6.9 (14.0) MB, 1.8 / 0.0 ms [allocation failure]. [35841:0x103000000] 5709 ms: Scavenge 7.5 (14.0) -> 7.5 (15.0) MB, 1.9 / 0.0 ms [allocation failure]. [35841:0x103000000] 6213 ms: Scavenge 7.9 (15.0) -> 7.9 (15.0) MB, 2.3 / 0.0 ms [allocation failure]. [35841:0x103000000] 6718 ms: Scavenge 8.5 (15.0) -> 8.5 (16.0) MB, 2.0 / 0.0 ms [allocation failure]. [35841:0x103000000] 7223 ms: Scavenge 8.9 (16.0) -> 8.9 (16.0) MB, 2.4 / 0.0 ms [allocation failure]. V8 needs to free memory for allocation. All the promoted data is now accumulating in the old space. V8 triggers incremental marking for a possible sweep GC event. The scavenge event happens in the new space while marking happens in the old space. So these two events can happen concurrently. In this scavenge event the marker marked memory in 9 steps which took a total of 1.2 ms or 0.13ms per step. Note that this is since last gc event which was at 7223ms. [35841:0x103000000] 8236 ms: Scavenge 9.5 (16.0) -> 9.5 (17.0) MB, 2.1 / 0.0 ms (+ 1.2 ms in 9 steps since last GC) [allocation failure]. [35841:0x103000000] 8743 ms: Scavenge 9.9 (17.0) -> 9.9 (17.0) MB, 2.2 / 0.0 ms (+ 1.1 ms in 6 steps since last GC) [allocation failure]. [35841:0x103000000] 9251 ms: Scavenge 10.5 (17.0) -> 10.5 (18.0) MB, 2.1 / 0.0 ms (+ 2.1 ms in 10 steps since last GC) [allocation failure]. [35841:0x103000000] 9755 ms: Scavenge 10.8 (18.0) -> 10.8 (18.0) MB, 2.4 / 0.0 ms (+ 1.5 ms in 6 steps since last GC) [allocation failure]. [35841:0x103000000] 10766 ms: Scavenge 11.5 (18.0) -> 11.5 (19.0) MB, 2.2 / 0.0 ms (+ 1.9 ms in 10 steps since last GC) [allocation failure]. [35841:0x103000000] 11274 ms: Scavenge 11.8 (19.0) -> 11.8 (19.0) MB, 2.1 / 0.0 ms (+ 1.2 ms in 6 steps since last GC) [allocation failure]. [35841:0x103000000] 12287 ms: Scavenge 12.4 (19.0) -> 12.4 (20.0) MB, 2.2 / 0.0 ms (+ 2.1 ms in 10 steps since last GC) [allocation failure]. [IncrementalMarking] requesting finalization of incremental marking. [IncrementalMarking] (Incremental marking task: finalize incremental marking). [IncrementalMarking] Finalize incrementally round 0, spent 0 ms, marking progress 0. Black - GC has found this object and has looked at all its neighbors. These have been fully processed. In this marking event notice that it is from the start of the marking event which started after the 7223ms scavenge event and not from the last GC event as was the case previously. In this case it also specifies that the longest step was 0.4ms. [35841:0x103000000] 12800 ms: Mark-sweep 12.8 (20.0) -> 12.6 (20.0) MB, 6.2 / 0.0 ms (+ 13.7 ms in 69 steps since start of marking, biggest step 0.4 ms) [allocation failure] [scavenge might not succeed]. Object size is now at 16.9 MB. Remember that the max old space is 20MB so we are close to running out. Notice also that the duration of each Mark-sweep event has gone up. From 2.4ms at 7223ms to 17.8ms at 18455ms. [35841:0x103000000] 13313 ms: Mark-sweep 13.2 (20.0) -> 13.2 (21.0) MB, 11.8 / 0.0 ms [allocation failure] [scavenge might not succeed]. [35841:0x103000000] 13830 ms: Mark-sweep 13.6 (21.0) -> 13.6 (21.0) MB, 12.2 / 0.0 ms [allocation failure] [scavenge might not succeed]. [35841:0x103000000] 14849 ms: Mark-sweep 14.2 (21.0) -> 14.0 (22.0) MB, 12.1 / 0.0 ms [allocation failure] [scavenge might not succeed]. [35841:0x103000000] 15366 ms: Mark-sweep 14.3 (22.0) -> 14.3 (22.0) MB, 12.3 / 0.0 ms [allocation failure] [scavenge might not succeed]. [35841:0x103000000] 15883 ms: Mark-sweep 14.9 (22.0) -> 14.9 (23.0) MB, 12.4 / 0.0 ms [allocation failure] [scavenge might not succeed]. [35841:0x103000000] 16399 ms: Mark-sweep 15.3 (23.0) -> 15.3 (24.0) MB, 11.7 / 0.0 ms [allocation failure] [scavenge might not succeed]. [35841:0x103000000] 17417 ms: Mark-sweep 15.9 (24.0) -> 15.9 (24.0) MB, 12.2 / 0.0 ms [allocation failure] [scavenge might not succeed]. [35841:0x103000000] 17933 ms: Mark-sweep 16.3 (24.0) -> 16.3 (24.0) MB, 12.9 / 0.0 ms [allocation failure] [scavenge might not succeed]. [35841:0x103000000] 18455 ms: Mark-sweep 16.9 (24.0) -> 16.9 (24.0) MB, 17.8 / 0.0 ms [allocation failure] [scavenge might not succeed]. 16399 ms: Mark-sweep 15.3 (23.0) -> 15.3 (24.0) MB, 11.7 / 0.0 ms [allocation failure] [scavenge might not succeed]. 17417 ms: Mark-sweep 15.9 (24.0) -> 15.9 (24.0) MB, 12.2 / 0.0 ms [allocation failure] [scavenge might not succeed]. 17933 ms: Mark-sweep 16.3 (24.0) -> 16.3 (24.0) MB, 12.9 / 0.0 ms [allocation failure] [scavenge might not succeed]. 18455 ms: Mark-sweep 16.9 (24.0) -> 16.9 (24.0) MB, 17.8 / 0.0 ms [allocation failure] [scavenge might not succeed]. Cannot get stack trace in GC. First came the scavenge event. No data is being freed so all data is promoted to the old space. Data keeps being promoted at a high rate which pushes V8 to trigger the incremental marker to prepare for a possible sweep event. As no data is being freed, all data objects are live the mark-sweep event has no effect. Eventually the system runs out of memory. This was an extreme example to show the various GC events. Let us now consider a more saner example. In this example we actually free up memory to see how the sweeping action works. For every tenth iteration the array ‘c’ is emptied. In the trace below I have removed some of the traces to improve clarity. [40225:0x103000000] 20 ms: Scavenge 2.1 (6.0) -> 2.1 (7.0) MB, 0.7 / 0.0 ms [allocation failure]. [40225:0x103000000] 21 ms: Scavenge 2.1 (7.0) -> 2.1 (8.0) MB, 0.7 / 0.0 ms [allocation failure]. [40225:0x103000000] 562 ms: Scavenge 4.0 (11.0) -> 3.6 (11.0) MB, 0.8 / 0.0 ms [allocation failure]. [40225:0x103000000] 7144 ms: Scavenge 8.8 (16.0) -> 8.8 (16.0) MB, 2.2 / 0.0 ms [allocation failure]. Marking started in preparation for a sweep GC event. Marking and Scavenge happen concurrently. [40225:0x103000000] 8155 ms: Scavenge 9.4 (16.0) -> 9.4 (17.0) MB, 2.3 / 0.0 ms (+ 1.0 ms in 8 steps since last GC) [allocation failure]. [40225:0x103000000] 10690 ms: Scavenge 11.4 (18.0) -> 11.4 (19.0) MB, 2.3 / 0.0 ms (+ 1.6 ms in 9 steps since last GC) [allocation failure]. enough sweeping(cleanup) as it can in the given amount of time so as not to hold up the application. biggest step 0.4 ms) [GC interrupt] [GC in old space requested]. [40225:0x103000000] 11702 ms: Scavenge 8.3 (19.0) -> 8.3 (19.0) MB, 1.6 / 0.0 ms [allocation failure]. [40225:0x103000000] 17247 ms: Scavenge 12.3 (19.0) -> 12.3 (20.0) MB, 1.5 / 0.0 ms [allocation failure]. Second mark-sweep event is triggered. Size of objects reduced from 12.6MB to 5.0MB by lazy sweeping in 5.9 ms.
Time increased compared to last sweep as more memory is swept. In a real live application 5.9ms is very high. During this time the application has paused. [40225:0x103000000] 17758 ms: Mark-sweep 12.6 (20.0) -> 5.0 (18.0) MB, 5.9 / 0.0 ms [allocation failure] [scavenge might not succeed]. [40225:0x103000000] 18263 ms: Scavenge 5.6 (18.0) -> 5.6 (18.0) MB, 1.6 / 0.0 ms [allocation failure]. [40225:0x103000000] 26335 ms: Scavenge 11.5 (19.0) -> 11.5 (19.0) MB, 1.9 / 0.0 ms [allocation failure]. Compared to the previous marking cycle above the reason for speeding up marking is different - "because of low space left"
[IncrementalMarking] (GC interrupt: finalize incremental marking). [IncrementalMarking] Finalize incrementally round 0, spent 0 ms, marking progress 1.
biggest step 1.4 ms) [GC interrupt] [GC in old space requested]. [40225:0x103000000] 27860 ms: Scavenge 5.2 (18.0) -> 5.2 (19.0) MB, 2.7 / 0.0 ms [allocation failure]. [40225:0x103000000] 28364 ms: Scavenge 5.7 (19.0) -> 5.7 (19.0) MB, 1.9 / 0.0 ms [allocation failure]. By now the typical GC cycle must be apparent in this case. The Lazy sweeper runs for a small time duration to free up memory. The idea is not to dig too deep into these traces but to get an overview of how your app is performing with one important thing in mind. During a GC event the application is blocked. It cannot process any request till the GC is over. If in the above example we were to reset every 100,000 bytes there would few, if any, mark-sweep events as everything would be done in the new space. No data would be promoted. As scavenges are fast the pauses would be very short. By the same token you can also set the size of the new space to allow for more scavenges. Given this knowledge you now have a way to check if your app is leaking and/or non performant. In my next post I will provide more realistic examples. 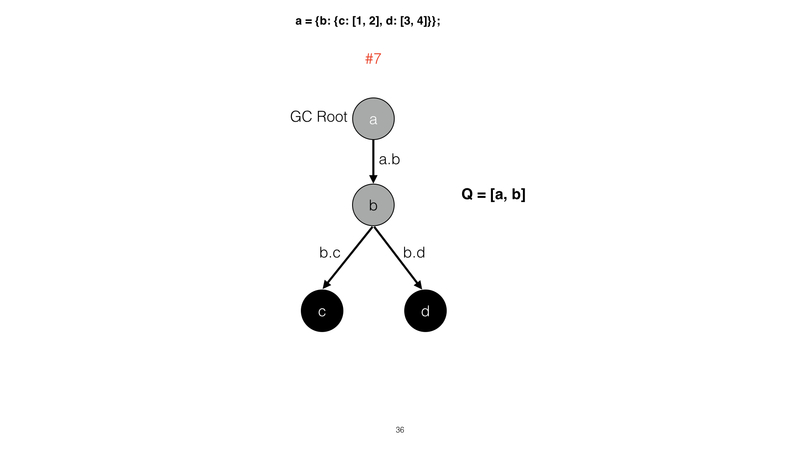 V8 uses an extremely simple technique for garbage collection. In this it scans the stack for any references(handles) which are active(live) and considers the referenced objects live. The rest of the heap is considered garbage(dead) and is marked to be reclaimed for re-use. One of the problems we face is that V8 is single threaded. When garbage collection happens the rest of the program stops. This is why it is called “stop the world” garbage collector. This has performance implications because if the execution of the program is held up for long it may result in sluggish behavior. From a UI standpoint this may result in browser rendering to be less than 60 fps resulting in the user experience being less than optimal. More information on this sluggishness in browser rendering, also called “Jank” can be found here. If you think about it, most of the allocations we request are localized to the executing function. In comparison the allocations that require to be alive across multiple function calls(e.g. globals) are fewer. For this reason V8 uses a “Generational” garbage collection system where the lifetime of the objects determine their placement in the heap. In this the heap is divided into two major lifetime sections or generations. The new and the old generation(or space). The new space holds objects that are short lived while the old space holds objects that are intended to be around for a longer period of time. This is how it works. Most objects(if they are not too big) start their life in the new space(young generation). When memory is required, V8 quickly scans the new space for any live objects and considers the rest of the objects as dead and re-usable. This quick scan and cleanup is called a scavenge(minor collection cycle) and usually lasts less than a millisecond. If an object survives two scavenge cycles it is considered “old” and moved(promoted) to the old space. At some point when V8 determines that it may need more memory in the old space it triggers a major garbage collection cycle(mark-sweep and mark compact) and removes dead objects from the old space. One consequence of garbage collection is memory fragmentation. Dead and live objects are intermixed in the heap. If there are many of these pockets of free memory(space occupied by dead objects it would make allocation of new memory slow as objects would have to be split up for storage. 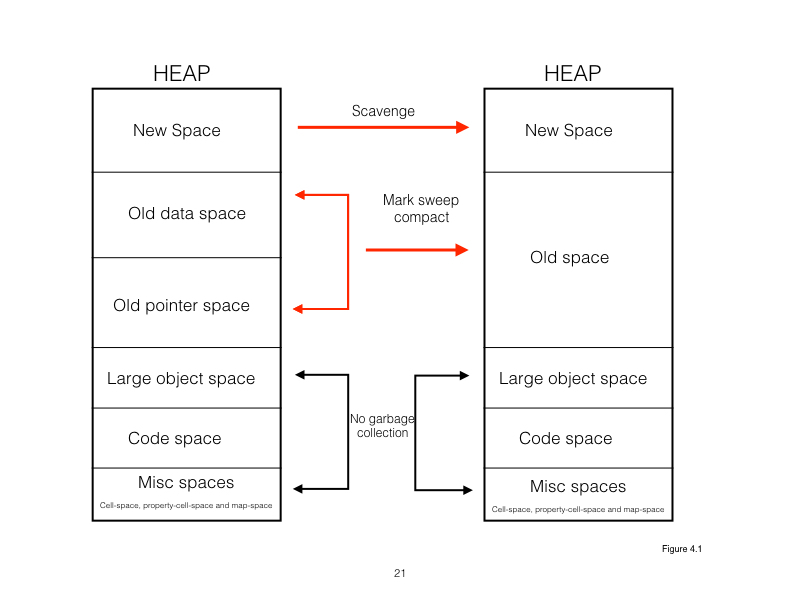 To fix this the garbage collector moves objects around and lays them out in a contiguous memory space. This process is called “memory compaction”. 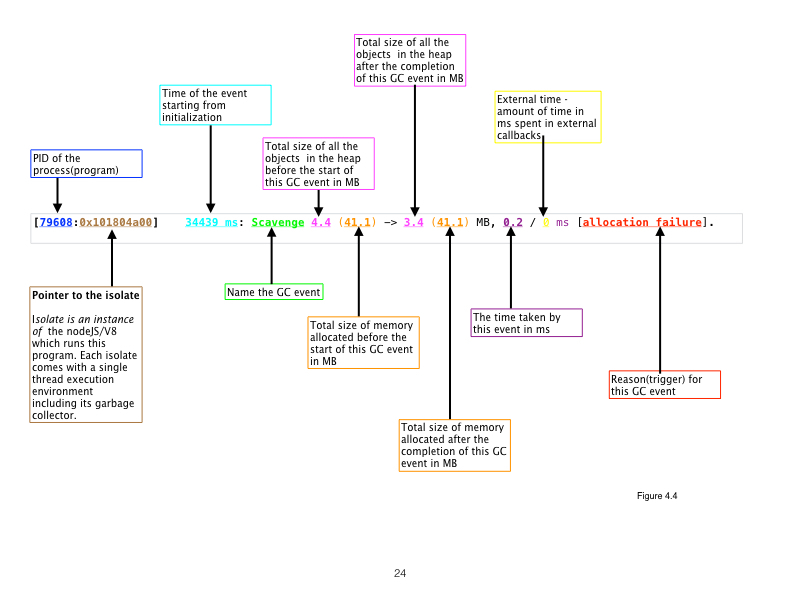 To understand both the minor(scavenge) and major(mark-sweep and mark-compact) cycle, it is helpful to visualize how the heap is divided in to spaces and their functions. The heap is divided into multiple sections or spaces. The spaces that are relevant to us are shown in Figure 4.1. below which provides a pictorial representation. Old Space = Old data space + Old pointer space: Promoted objects from new space and other raw data objects and pointers respectively. Mark-sweep and mark-compact work in this space. Other miscellaneous spaces: These include the Cell space, property cell space and map space and they contain specialized data and pointers. No garbage collection takes place here. Within these spaces we will concern ourselves only with the new space and the old space. Let’s look at scavenges and the new space first. 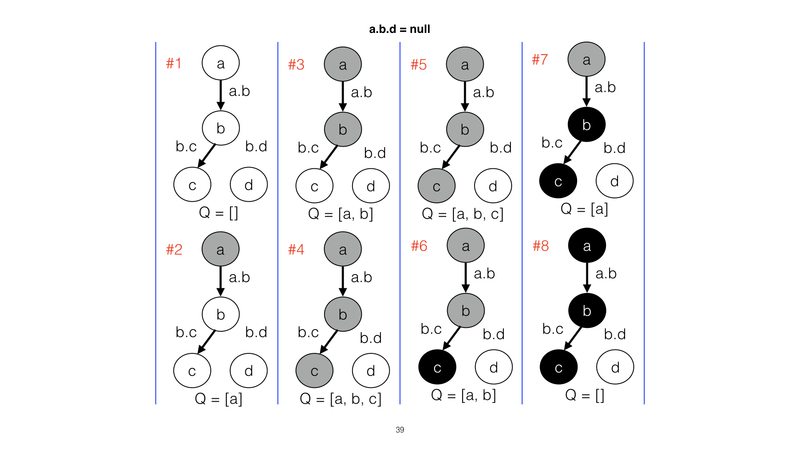 Consider this simple example(Figure 4.2) in which a string of 100,000 bytes in length is created and stored in the local variable text. The setInterval timer runs the aString function every 200ms till the program is aborted . It is clear that there should not be any memory growth, because every time the function returns the variable “text” goes out of scope and is discarded. The program does not have any practical application but works well for learning about scavenges. Running this piece of code with the trace_gc option in the terminal we get the output in figure 4.3. The dissected trace(the one in bold) is shown below in figure 4.4. This is the simplest of the gc traces that V8 offers. It gives an excellent overview of memory allocation. This is also the first trace I run to check on how memory allocation is doing. The explanations given in the figure for the dissected trace are self explanatory. It is a scavenge event, triggered as a result of allocation failure. In other words V8 ran out of memory in the new space and decided to reclaim dead space. Each gc event is less then 1.0 ms. This is ok. If this time tends to increase then there is a possibility of a leak. It means that V8 is finding it hard to gc. The difference in size of before and after objects which is about 1MB remains fairly constant. The before and after overall memory size(41.1MB) remains fairly constant. This indicates that all of the dead space is being cleaned up. If it did not, then this would be another indication of a leak. In real applications it is not this ideal and some variation should be expected. Initially the pointer is at 0th byte. The pointer moves 100,000 bytes from 0 to 99999 bytes. The pointer is at the 100000th position waiting for the next allocation. When allocation is requested for the text variable (11th allocation) V8 finds that there is no memory left in the new space. V8 reaches out to the stack and finds that there are no live objects. This means all of the new space contains dead objects and can be re-used. Please keep in mind that V8 uses a variety of techniques to trigger a GC. Also, it tends to manipulate the size of new space depending on current conditions. This is the reason why the trigger points are never the same. It is the trend that is important and not the exactness of the values. 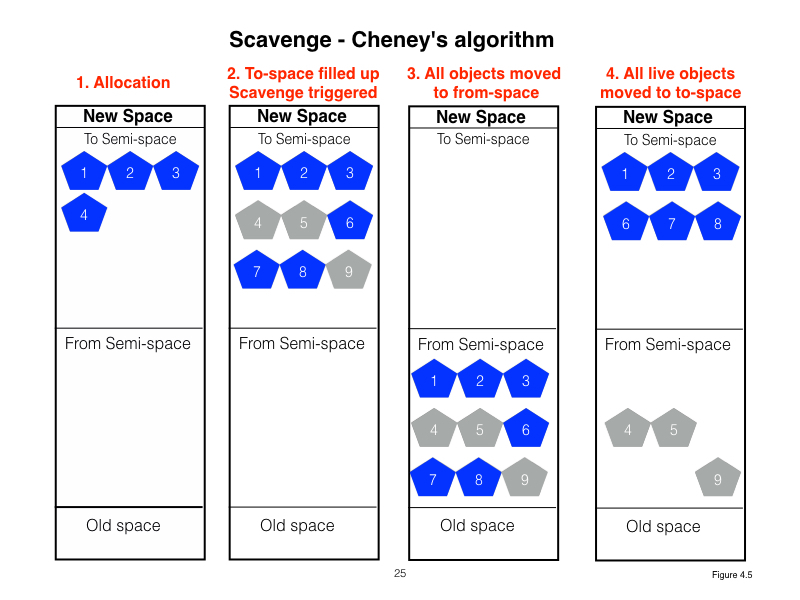 V8’s scavenge is based on Cheney’s algorithm. In this, the new space is divided into two semi-spaces, the to-space and from-space. There are five steps that the garbage collector goes through to GC. To and from spaces are swapped out. At this point to-space is empty and from-space is full. Live objects are copied from from-space to to-space, laying them next to each other in contiguous memory locations. This also compacts the memory. from-space now only contains dead objects while to-space contains only live objects. Note: Live objects are in blue, while the dead objects are in gray. from-space is now fully reclaimed and can be reused and the cycle continues. For a pictorial representation see figure 4.5 below. We used a simple example to displayed the V8 GC trace and further dissected it to see how scavenges work. No special tools were used. As such, you can start using it with your existing projects. I will talk about Mark sweep and mark compact next time. The heap, objects dead or live? In the last post I discussed the stack. To quickly recap, the stack is LIFO which is fast and managed automatically. It is small in size and stores only local variables(immediate small integers). Everything else is stored on the heap. The heap, compared to the stack is bigger in size, more freeform in nature and stores reference types such as objects and strings. Variables that have to span function calls, including globals and variables captured by closures are also stored here. The heap is dynamically allocated by the OS. It is self managed, that is, the running program(in this case V8) makes requests from the OS for allocation and de-allocation. It is divided into multiple sections or spaces. The spaces that are relevant to us are the New Space, Old space, Code space, Map Space, Large object space. More on this when I talk about garbage collection. However for now it is extremely important to understand how the stack and the heap interact when a function or an application is executing. A heap can be imagined as a network of interconnected objects. Consider the example we used in the previous post drawn a little differently. aSmallInt is a SMI (immediate 31-bit integer) stored on the stack. aFloat is a number object so a reference(a handle in V8 speak) is stored on the stack with the number object on the heap. anObject is a literal object. Reference to this object is stored on the stack while the object itself is stored on the heap. The object is split up into three other string objects one each for a country code. This is a very simplistic rendering of an object graph. The local handles (or references) point to the objects on the heap. 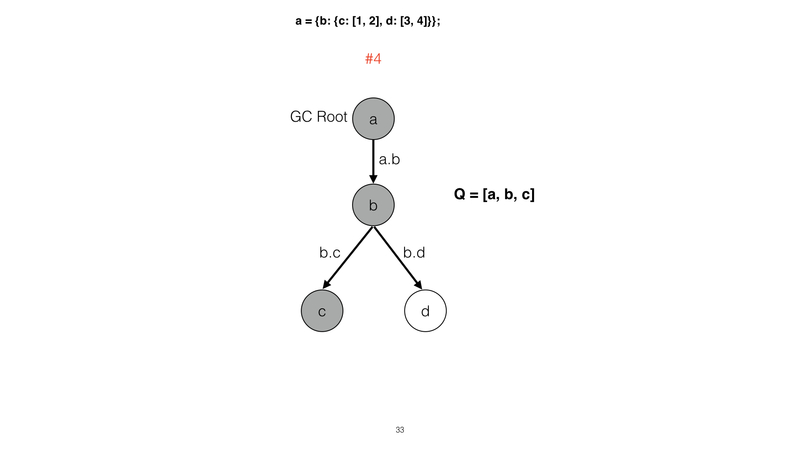 The fact that the heap is a network of interconnected objects becomes clear with an object graph. As long as the parameters of the function test exists on the stack, its handles(references) exist and so do the objects on the heap. The objects in the heap are called live objects. Once the function ends (returns) both the handles go out of scope and the objects in the heap are now considered dead. V8 can now reclaim the memory area used up by these objects. Understanding dead and live objects is important for visualizing how the code affects garbage collection. An object is considered live if it is being referenced by some chain of pointers to a root object or another live object. I will discuss two examples to illustrate this. The literal object countryCodes is global. cc, the variable which will hold the results is initialized with an empty string and is a global. countryAbbreviation is a local variable and a string. ret, the return variable is also a local variable and a string. 1. Before getCountryCode is run the graph looks like in the following figure(3.4). 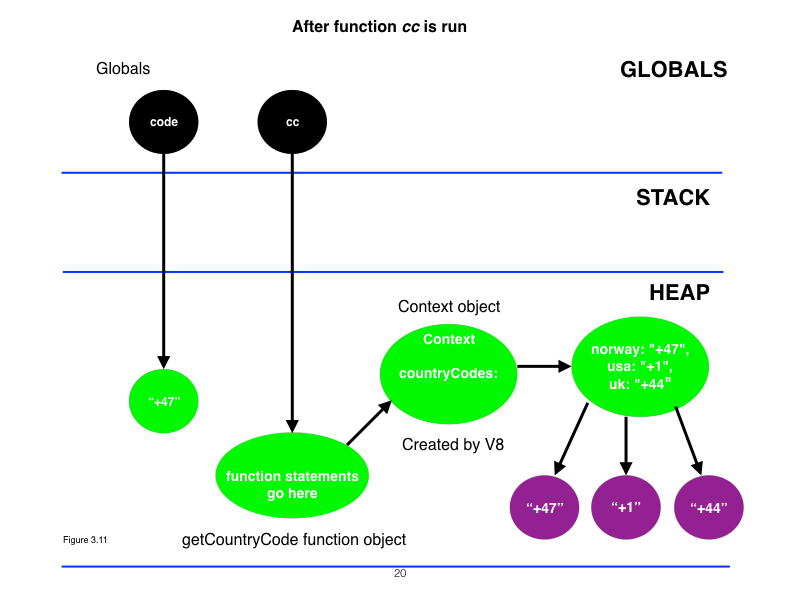 Note that both the global variables, cc and countryCodes are stored in the heap pointed to by global handles. 2. 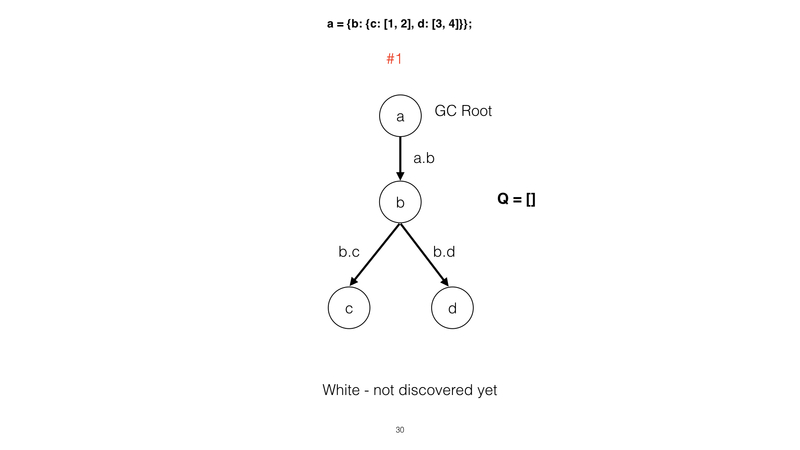 Before the functions ends, that is before getCountryCode returns, here is how the object graph looks (figure 3.5). Now there are two local variables. Both are string objects and stored on the heap pointed to by local handles. 3. Once the function ends(returns) the graph looks like in figure 3.6. As the function has ended, both ret and countryAbbreviation string objects have lost their references and now can be cleaned up by the garbage collector as these objects are dead. On the other hand both the global variables cc and countryCodes remain alive and the garbage collector will not touch them. On entering the module, countryCodes object and cc which are global variables are allocated space on the heap. Both the globals are considered as root objects. The stack is empty at this point. On entering getCountryCode, ret and countryAbbreviation, both local variables (not small integers) are stored on the heap with the references on the stack. Both the local variables are considered root objects. They are also live objects as they can be accessed within the function scope. In other words they are live for the entire execution of the function. When the function returns, the global variable cc contains the value of 47, the country code for Norway. Both ret and countryAbbreviation go out of scope, are popped from the stack and discarded. The references to the heap for ret and countryAbbreviation are removed. Both ret and countryAbbreviation in the heap are considered dead. Both globals are still live as they can be used again till the program terminates. Now consider the same example but in a form of a closure in which processCountryCodes returns a reference to the inner function getCountryCode. Please note that the variable getCountryCode to which the function is assigned is redundant and used here for clarity. I could have easily returned the function itself directly. 1. Before the function processCountryCodes is run the object graph looks like in the figure(3.8) below. Both global variables are allocated space on the heap. They are referenced via global handles. Simple enough. The inner function getCountryCode is a closure and closes over the object countryCodes. In other words before processCountryCodes returns it needs to save a reference to the countryCodes object. This is because once processCountryCodes returns, the stack will be wiped clean. To retain the reference V8 automatically creates an internal object called the “Context object” which is an instance of the JSFunction class and adds the countryCodes object to it as a property. For the same reason V8 also allocates space for the inner function in the heap. Please remember that V8 creates the context object when it enters the outer function processCountryCodes. 3. Before the function processCountryCodes returns the object graph looks like in the figure 3.10. The global variable cc now holds a reference to the inner function getCountryCode. 4. 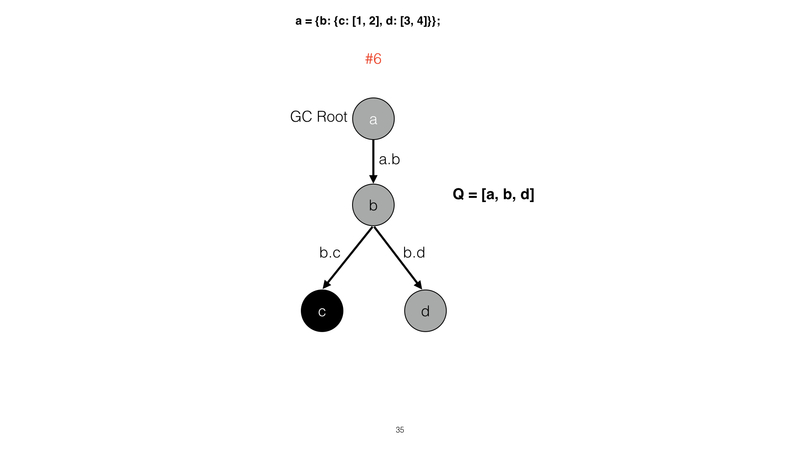 On execution of the inner function the graph looks like in the figure 3.11 The global variable cc now holds a reference to the inner function getCountryCode. Global variable code now contains the result “+47”. Please note that I have not included the objects for the inner function because that is the same as the earlier example. On entering the module, cc and code which are globals are allocated space on the heap. The stack is empty at this point. cc and code are now considered live root objects. 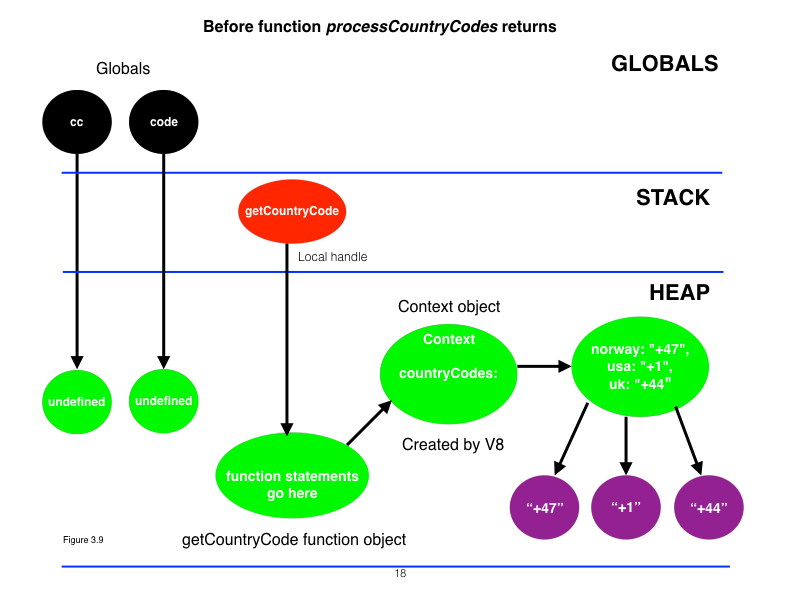 On entering processCountryCodes V8 builds a special “Context” object on the heap and adds the countryCodes object as a property to it. Once processCountryCodes returns, global variable cc holds the reference to the inner function. Global variable holds the result “+47” once the inner function is executed via the global variable cc. 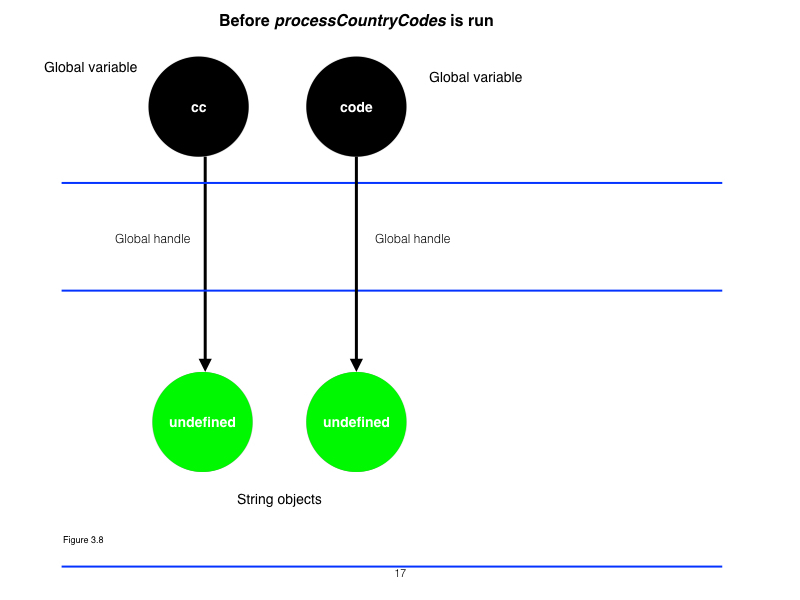 The key point here to note is that even though both processCountryCodes and getCountryCode have been executed the heap structure remains intact. The reason is that both the global variables will keep holding references to the objects in the heap till the program terminates. I hope that you now have the necessary tools to visualize your code in terms of an object graph. In the next post I will talk about Garbage collection as it relates to the heap and build on the information in this post.